Did you ever think you could write about New England-based acts you love and have them read by many fans of local music? The Noise would love to publish your opinions. Send T Max an email tmax@thenoise-boston.com with LIVE REVIEWS in the subject and T will get you started writing live reviews. 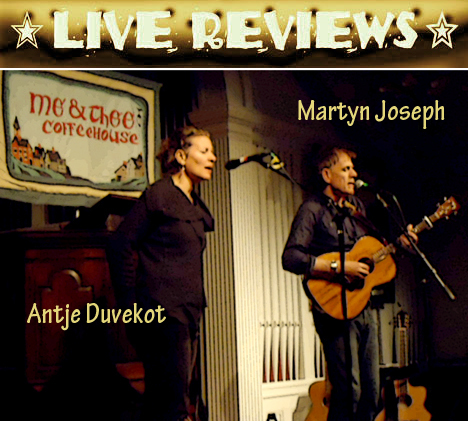 Me & Thee Coffeehouse is to New England folk music as The Rat was to Boston rock ’n’ roll. 47 years of presenting the best folk music from around the country. The place is run by many volunteers, all working together to make the place a wonderful experience for the audience. There’s a stage crew, sound technicians, folks in the kitchen preparing, serving and selling halftime treats, door people, merchandise people, a booker/publicity person, and a master of ceremonies. That’s the kind of team it takes to run a good coffeehouse. Tonight’s show is an example of the quality I’ve come to expect at Me & Thee. Antje Duvekot is a seasoned pro opening the night with songs of the personal relationship type. She plays with a pretty constant spot of tremolo on her Martin acoustic. It gives a little extra feeling of the vibrations that run through her heartfelt music. She sings about “Dublin Boys” and “Mexico” (partly in Spanish, though German is her true second language). Then she takes a chance in doing something she’s yet to do in performance… she reads a text she sent to a friend earlier who asked her about her date with Brian. She reads what is written in metaphors involving explorations of dangerous but interesting caves. It was a little hard to follow, but I liked the change up and how it broke up her set. She ends with the beautiful “Sleepy Seas of Indigo and Blue” from her latest release, New Sibeia. Here we go… one of the best local shows I have seen in many many months presented in a superb listening space in one of the city’s supreme museums. Please, let’s have more of these scenarios! Tonight it’s a brilliant double bill featuring two of Boston’s most challenging progressive rock talents. Opening is my fave, Bent Knee, presenting a set of mostly new dynamic material from their upcoming album, Land Animal – except they’re performing acoustic! I have never seen this application before – grand piano, processed violin and acoustic guitar, hands-on-drums, bass, (though no sound board wizardry) – but still delivered with intensity and aplomb. Less roar, more grace. In addition to old favorites such as “Leak Water” and “In God We Trust,” they debuted “Terror Bird,” “Time Deer,” Insides In,” and the masterful closer, “Bones,” As when I saw their lovely lead singer several months ago in a solo performance, Courtney Swain continues to display a stunning vocal beauty and keyboard control fronting this ensemble. That said, this is still a TEAM effort with all individuals locked in synch. Always in forward motion, focused, fearless in their determination to expand their genre’s dimensions, their realized compositions will pave their way to an even brighter future. Hang on, fans! Kudos to Ben, Chris, Courtney, Gavin, Jessica, and Vince! AfterHOURS is Northeastern University’s late night performance venue and it is truly a hidden gem. Any night of the week you can catch the college’s best student talent as well as local and national acts, though the venue is typically restricted to the students and their guests. Tonight’s show features EDM legend Dan Deacon from Baltimore, with support from local up and coming act, Department of Everything. I saw these guys once at the Midway in JP and they quickly became one of my favorite local acts. The use a payphone, a gas mask and an euphonium to fuse into a truly tasty recipe of art rock, rap and electronica. To say its unique listening experience is an understatement, especially once you catch a live show as animated as theirs. The band is at one with the large crowd of onlookers, weaving in and out of the crowd as they sing and play. Soon everybody is literally wrapped up in the music and enjoying a fun night out. As they were only the support act, the majority of people may have never heard of the Department of Everything before this show. After this show, no one will forget them. What a band! (Kier Byrnes). Blindspot, a promising up-and-coming band, starts the night in a forceful way with their rock music. Powered by two electric guitars and a cymbal-focused drum beat, they are consistent and perform with a discernible confidence, sounding like they have been playing together for years. The band is led by lead singer Alexa Economou, who also plays the guitar for some songs. Fellow guitarist and keyboardist Chris Cormier and drummer Austin Ferrante lend their talents to create the commanding sound. Economou’s vocals are incredibly strong, but the instruments are just as creative and crucial to the performance. For this opening set the crowd is fairly small, comprised of some college-aged kids as well as some parents, since the band members look to be in their early 20s. Economou has a great stage presence, dancing about and trying to get the crowd involved. She wears sunglasses and has the band name written on her arm for people to read, and I assume this is part of their look. Prefacing their cover of The Killers “When You Were Young,” she sarcastically tells everyone that they might know the words and that they should sing along. The band released their self-titled debut EP last month, and mostly play songs from that. By the way they sound and perform, I am shocked that they are just starting out. They definitely have a rock style, but they incorporate some pop elements through electronic sounds and the use of the keyboard. Cormier is wearing a shirt from the band Chvrches and I can certainly hear elements of inspiration from them. After many songs from Blindspot, Aeronaut Down takes the stage and maintains the energy of the night. As more people have trickled in, I’m finding it more difficult to see the stage because of my unfortunate height. Thunder Road seems to be the place where all the tall people ended up tonight. In any case, this group of four guys is equally as talented as the first band with a bassist who also plays the keyboard, a guitarist who switches between acoustic and electric, a drummer, and lead singer who, like Economou, plays the guitar for some songs. They have a very distinct style that seemingly merges many genres ranging from folk to hip hop to rock. They include some electronic elements to create the folk sound in their opening song, yet lead singer Nick Cardone tends to rap than sing. Still, for other songs, the vocals are more melodic and emotional and the instruments alter their sounds to match. The band announces they have been working on new material and play a few new pieces. “Coincide” is one of the slower ones, but it still has a solid beat. It’s an evening of pop with heavy cosmic jazz influence as Melissa Weikart brings a dreamy sound into the Club Bohemia cavern (downstairs at the Cantab) that is usually noisy and loud. Adam Tuch is dominant with his smooth and inviting keyboards over Zach King’s drums and Devon Hurt’s bass. Weikart plays to a substantial and appreciative crowd on a beautiful Thursday night in Central Square, Cambridge, MA. The diva’s voice reaches amazing heights over Matt Okun’s liquid guitar strums with bass, drums and keys. They all generating a symphonic, airy bit of mystery, embracing Weikart’s lyric in a pleasant and entertaining way. Engaging renditions of her “Our Room,” White Dress,” “New Normal” and “Broken Records” gives way to Weikart sitting down at Tuch’s piano to perform solo. “Unconventional, but it’s happening” she notes as they were able to get the stand-up microphone at the right height for “Humans.” The solo material, in particular, seems perfect for a new Twilight Zone, odd piano sounds and a vocal sound that go contrary to the notes she pluckes off of the keyboard, quite difficult to pull off. The audience, all the tables and chairs filled, but still intimate, keeps quiet during the solo portion. Pure artistry at play and a very welcome change of pace for our cellar full of noise in the cavern under Massachusetts Ave. The pews at Me & Thee are packed tonight! Why? Hayley Reardon is the talented 20-year-old that not long ago was Marblehead’s blooming child prodigy. Her fan base paid for the production of her latest CD,Good, and they are here tonight to experience the latest growth spurt of their rising star. Opener Ryan Hommel is another wunderkind. Immediately I can testify that this young man (23) is headline material. His first sung words are “I’m so tired of writing songs for you” and though that initially brings gasping laugher to those in attendance, he swiftly pulls the song back to a serious note. His quick wit, flawless melodic playing, friendly presence, and songs worth listening to tell me this cool looking guy with the eyeglasses and fedora has a colorful career of music ahead of him. Behind him as well, as he has twisted his way up the rope of success by backing many a talented artist. He says that Hayley has called “I’m Giving In Again” a song about balance, though he sees his song about breaking promises that you’ve made to yourself. He picks the right depth to lower his lure and I’m hooked as a new fan. With his only happy song, “Reds and Yellows,” he closes his short set while I’m still wanting more. His name currently sits on the top of my list of performers you must go see. In this quaint bar and mellow environment, Dam Chick Singer plays their smooth jazz-style of music. Lead singer Denise Cascione provides distinct vocals with support from acoustic guitarist Joe D’Angelo and drummer Pete Premo. Their style matches the look of the bar, with Renaissance paintings on the wall and heavy red curtains that mirror the dark walls. The jazz and blues sounds, combined with the smooth vocals, creates the perfect vibes for the night. The bar is a bit separate from the dining room where the group is playing so it is harder to see them, but they are still audible. Everything about their performance is laidback; the percussions are very soft and rhythmic. The guitar is perhaps the most noticeable instrument, as it is intricate and complex, yet subtle enough for their style. Cascione’s vocals are outstanding and she is truly a soulful and talented singer. They play a few covers and some original songs. There are not many people here to enjoy their talents, but they put on a solid show, nonetheless. Her voice tend to stay at the same tempo and level, even when the instruments pick up the pace for some tunes. Performing with only two acoustic guitars, the duo comprised of Wendy Saydah and Peter Banker play folk and acoustic songs. They throw in a few originals that match the style and simplicity of the ones they cover. Sharing the vocal responsibilities, their voices blend beautifully with Banker’s harsher approach complimenting Saydah’s softer sound. Since it is a Saturday night, the place is very full and I am forced to hang out in the back by the bar, making it even more difficult to hear. Saydah’s voice is quite calm, and even when they are both singing, it is challenging to distinguish the lyrics or song. Despite this, their talents shine through on the guitar. Since these are the only instruments they have, they make the best use of them. Just as their harmonizing voices paired so nicely, so do the guitars. No matter what song they are playing, their intricate guitar work compliments each other’s abilities to create a wonderful sound. Although there is not much variety given the limited resources, the folk style of their sound suits their overall demeanor and personalities. There is not a whole lot of crowd interaction, as most people tend to come here to drink, not necessarily for the music. The two tend to flow into each song without much communication with the crowd, but not in an arrogant way. In a surprisingly full art gallery in Lowell, O.S.O.S. performs with a bassist, guitarist, and vocalist. The guitarist plays the acoustic guitar, but strums with so much energy that it captivates the crowd. Even with only two instruments, the band is very polished and creates a style that utilizes every aspect of their combined talents. The room is filled with presumably friends of the band, many of which are photographers taking pictures of the gallery, the stage area, and the band. The “stage” is just an area set up in the front of the room by the door with large speakers. There is a small disco ball spinning above the musicians, adding some uniqueness to the room. As soon as the band takes the stage, they immediately start playing and the lead singer’s soulful voice is instantly striking. He is so full of power and emotion and sings with an incredible range. While the guitar is certainly the most noticeable instrument, the bassline has a strong undertone throughout all of their songs. The singer makes it seem as though they are just starting out, explaining that they “go by the name of O.S.O.S.” with some hesitation, as though this could change. Even still, the band plays with an astounding confidence and energy. Supported by the rapid guitar playing, the singer raps for the verses of certain songs and sings for others. He is much more forceful during the choruses where he tends to belt out the words. The group does not talk much, but rather they move into each song effortlessly. Since there are a lot of people here and I am in the back of the room, it is a bit difficult to discern the lyrics with all the chatter going on. There is a bar in the rear, so not everyone if here for the music, although it is the main focus of the gallery tonight. However, the instrumental components are quite audible, and they are impressive. Mike Morrissey’s aching vocal works over interesting guitar weavings, the space in between the strums and the voice play with the imagination in a nice way recalling hit artists Norma Tanega, Tim Buckley and Janis Ian. Morrissey uses subtleties to make his point, and a good transition for the audience. Morrissey’s set goes from She Smiled, Unseen, Arrive, Heartbeat, Puppets, Hands, Miss June, Fool’s Gold, and Rainy Days… in that order. Billy Quill’s voice and compositions are drenched in bluesy pop with a solid groove with words that combine insight with introspection. The instrumentation sometimes dangles in the air, as does his voice, to good effect. Haley Katrin is backed by guitarist Adam Sickler and drummer Shade Tramp –they’re create an entertaining mixture of sounds seguing from acoustic to pop rock with a heavy backbeat. Katrin’s authoritative voice punctuates each note with the precision of a pro, but rock ’n’ roll enough to let the band drive with a nice ragged edge. Haley’s set consists of Be Your Girl Skate By Sheep Sugar Water Angel from Montgomery Half Past 3 23 Tinder Hipster Prince. Brooke Sofferman takes the stage playing the drums, and he is accompanied by a pianist playing a sort of double piano with two sets of keys parallel to each other. Their style is most comparable to jazz, but they add a modern flair. The drums are very cymbal-heavy and the piano maintains the blues and soulful sound. The two rarely sing, but rather prefer to let the instruments do the talking. The drum kit is fairly small with only a bass, snare, floor tom, mounted tom, and a few cymbals. It is clear that Sofferman is experience and confident, as he barely looks at the drums when he plays. Likewise, the pianist shows his skills when he plays both levels of the piano keys, one hand on each level, with ease. They each have a solo every few songs, especially during the longer songs that do not have lyrics. The piano tends to play at a faster speed than the drums, which are more rhythmic. Some songs are more drum-focused while others have a stronger draw to the piano. They cover a few songs, which require singing, and Sofferman begins to sing and drum effortlessly. Their cover of Wilson Pickett’s bluesy and soulful “Mustang Sally” displays the intricate piano skills of the pianist. They follow with a few more instrumental songs, as well as a cover of “I Wish” from another soulful icon, Stevie Wonder. With a crowded environment, it’s difficult to hear all the distinct aspects of the performance, but the general sound and style is solid. The five-piece band known as Eclipse is placed in the back corner of the restaurant with just enough room to dance to the music. Comprised of a drummer, bassist, guitarist, and two singers, the group has a well-rounded sound that allows them to cover various genres and mix in a few originals. Their slogan is “no genre is safe” and they prove that tonight by playing a range of songs. The two singers, Peter Zicko and Robyn Spinazola, alternate between singing the lead, and some songs feature the two of them singing back and forth. Besides a few instrumental solos here and there, especially bass and guitar solos, the crowd’s attention is drawn to the singing. One of the more notable covers is of Muse’s “Uprising,” sung as powerfully as the original and the instruments adequately support the vocals with intense bass lines and drumming. Most of the band members are from surrounding areas, so the crowd is full of those who appear to be friends of the band. They are actively dancing along to the music and intently watching them play. While they are setting up for the next song, Peter tells the crowd that there is “no charge for dancing” and asks how they are sounding, since the room is fairly small. At times, Peter’s vocals drown out Robyn’s, just because he sings louder and deeper compared to her soft, higher-pitched voice. Robyn has her time to shine when she sings a cover of “Ex’s and Oh’s” by Elle King. This seems to be a popular cover song, one that I have heard a few times the past few weeks, but Robyn does an excellent job with her stellar range. The style of the song fits her vocal abilities perfectly. Towards the end of their set, they call a young woman up to the stage to sing and I later discover she is the hostess of the restaurant. She starts out a little shaky and sings too quietly, but she quickly finds her rhythm and performs excellently. The performances tonight are benefiting the fifth annual Chords for Cancer event, which was originally started by Jess Hall, the lead singer of another local band, Oldsoul. The event is raising money for UMass Memorial Hospital’s Cancer Center of Excellence and is sponsored by Counter Intuitive Records. The first band to play is a jazz-based band, People Like You. Comprised of a guitarist, keyboardist, drummer, bassist, and trumpet player, the band has quite a full sound. The trumpet arguably stands out the most, simply because the other instruments have more of a rock sound, and the trumpet brings a strong jazz element. Both the guitarist and keyboardist switch off singing for certain songs. Their voices are so different that it almost sounds like two different bands are playing. Chris Lee, the guitarist, has a much harsher voice which he uses to yell the lyrics at some points. Contrastingly, Michi Tassey has a much softer voice that calms down the otherwise overloaded sound. Neither of them sing often since the style of the band is more instrumental, but when they do, it greatly impacts the performance for the better. Like Matt Hull’s trumpet playing, when they sing, it captivates the audience. There is not a lot of crowd interaction from the band, they just flow into the next song. Before they do so, they tend to draw out the endings of the tunes, with each instrument slowly fading until there is only one or two left to hear. With such an instrumentally-based performance, this is an excellent touch that really displays their talents. Towards the end of their set, they mention that they are selling T-shirts and that all the proceeds will go to the hospital’s cancer center in support of the event.